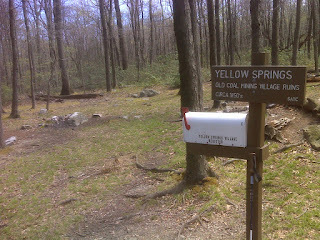 Wow, the trail was fast today (Tuesday April 17th). No Rocksylvania to speak of. 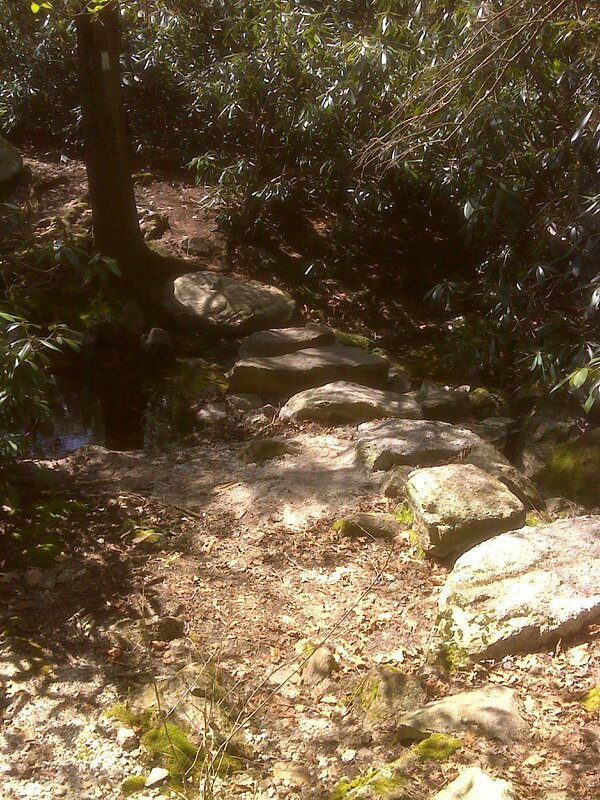 Particularly on Sharp Mountain where the ridge is broad and flat, and the trail is straight and level and free of the kind of rock that gets in your way. I didn't take many photos today. Sorry. The one impression I couldn't capture in a decent photo was the side-slope traverse of Stony Mountain. First of all you are passing beside DeHart Reservoir, but there were no more than poor winter-view glimpses of it. More immediately, you are walking the remarkable north slope of this mountain, which is entirely covered, from ridgetop to valley, and for miles on end, with medium sized boulders - tumbles and jumbles of them - only trees managing to stick up through the maze of rock. Fortunately the AT follows a wide bulldozed former road along this entire stretch - no actual rocks to scramble over. 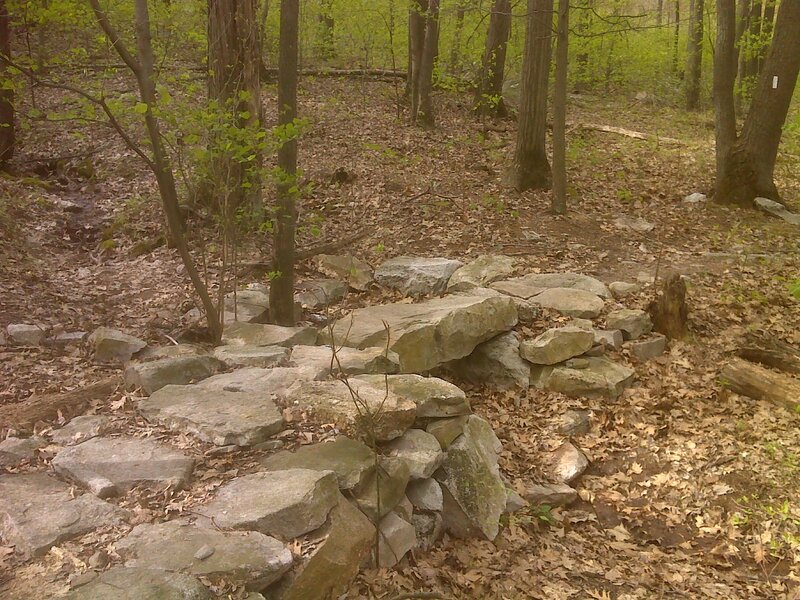 The AT picks up this road after a preliminary meander through the more gently sloped but still stony apron of the mountain, up from PA 325. 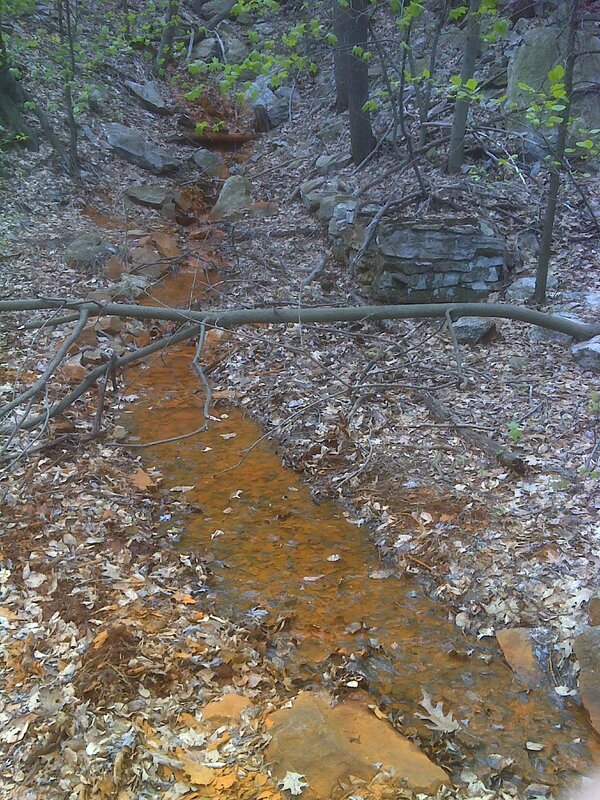 The road then passes old coal mines, one with a horribly contaminated stream gushing out of the hillside. 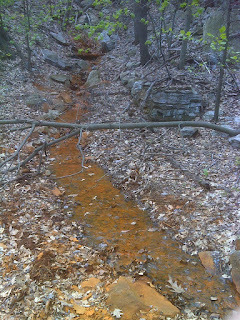 There are chunks of the hard coal along the road for the interested rock hound. And there are stumps of the former telephone/power poles that somebody cut down, perhaps to pilfer the copper wire. 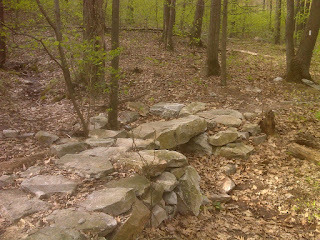 Finally the road ends at a summit with an old fire tower foundation just beyond the terminus of Horseshoe Trail. Next (for the northbound hiker), the trail crosses over to Sharp Mountain, crossing a little stream on big stepping stones (the trail builders through this area seemed to enjoy hefting huge rocks - see another impressive example of their work below). There on Sharp Mountain the fast lane begins, only interrupted by a small ravine just before the 'ghost town' of Yellow Springs. I've visited ghost towns in the Rockies. South Pass City, Wyoming stands out in my mind at the moment, where you could still go in the buildings and rummage around - at least in the 1970's you could. Here there were barely any stone foundations to see - rather a let-down - though I did not take the blue blazed Yellow Springs side trail, which reportedly leads past some 'good stuff'. Back the way I came, as usual, I was enjoying a brisk walk in near-ideal hiking weather. An all-around fast-lane day.